The 2014 Commonwealth Games in Glasgow kicks off today. It’s the 20th edition of what was once known as the Empire Games and this is the third time Scotland has hosted the event, both previous times being in Edinburgh (1970, 1986). The Commonwealth Games’ 4-year cycle means it has to compete with a World Cup each time around – a media, advertising, branding and PR juggernaut that is impossible to match. Most of us can identify the logo, or at the least a colour palette and look and feel of past World Cup tournaments, and the same can be said for past editions of the Olympic Games. The Kuala Lumpur 1998 logo is the closest a Commonwealth Games has come to the London 2012 Olympics abstraction. The first Games in Asia produced a clip-art style logo that placed ’98 at the centre of the design and abbreviated Commonwealth Games to “CG”, as well as a colour scheme not dissimilar to the World Cup 1998 logo. As a whole it’s not that great, but it’s not that bad. At the very least it’s quite iconic and should receive plaudits for persisting with a design that attempts to stand out. The motto sounds like an awkward Google Translate and fails to be memorable on any front. However, using a goofy monkey in athletic gear as a mascot makes up for that. 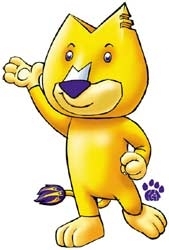 The Manchester 2002 Games were very yellow. The logo itself was less of a design and more of a colour, but the three towering figures (presumed to be) standing upon a podium nicely tied in with the Games’ motto. In terms of type, the identity of the Games is clearly expressed through clean and easy to read lettering. Things get a bit strange when it comes to the mascot that seems to simply be a dog with a strange haircut. The Manchester 2002 branding has stood the test of time, but it doesn’t exude ambition. The Melbourne 2006 logo is a strange one. It depicts 2 abstract figures that look like they’re competing in gymnastics and running, but when compared to the human figures in the Manchester 2002 logo they seem beyond peculiar. The colours used are most certainly eye-catching, but the design screams of somebody trying to make something interesting out of the mundane. They actually resemble some melting human abstractions that can be found scattered around the streets of Ljubljana in Slovenia. 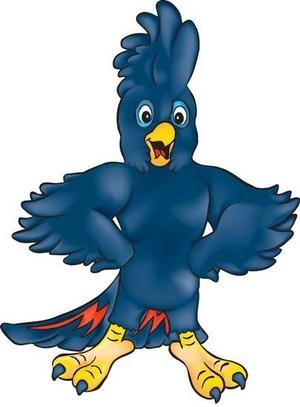 The Game’s mascot was a red-tailed black cockatoo named Karak, a threatened species within Australia which forms a nice touch. However, commentators noted that it was replaced by a “white duck” in both the opening and closing ceremonies. Answers on a postcard. The Delhi 2010 logo appears to be as rushed as the preparations for the Games itself. The bold and imposing typeface is effective and tidy, but the graphic design of the body of the logo is cringeworthy. Not only does is attempt to cram in about 8 different colours, but looks like it has been rendered by a primary school student that’s using Photoshop for the first time. If the perspective issues with the logo were corrected it could be rescued and even be made to look appealing. Instead it seems flat, one-dimensional and something that ultimately looks like a draft instead of the finished product. The Delhi mascot was a tiger in its athletics gear named Shera, supposedly “a positive character, with a global outlook”. I’ll take Delhi’s word for it. The Glasgow 2014 logo cost a hefty £95,000 to design and is apparently based on the “three principles of sport – time, data, and measurement”. I can’t honestly say that I glean that from glancing at the logo, but it most certainly does look like a schooling in circles and geometry. Detractors of the logo claim that the design company behind it has ripped off one of its earlier creations and that this concoction is essentially second-hand goods. If I was part of the organising committee I would be more worried about the logo looking like a variation of the copyright symbol. The logo does, however, look pretty cool in 3D and seems designed to be animated on our TV screens during the Games. 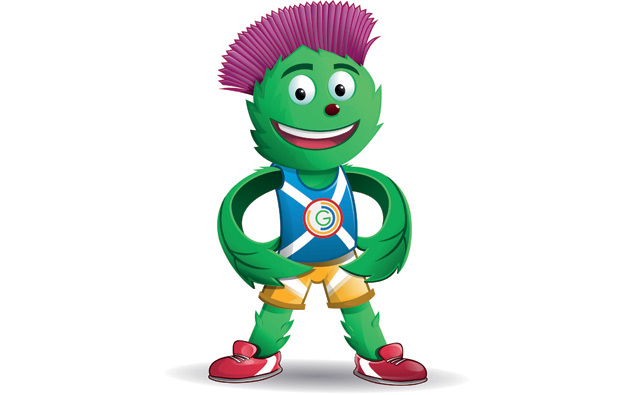 The worst part of the Glasgow Games is unarguably its mascot. Named “Clyde”, he’s a “thistle man” named after a river that’s been designed by a 12-year-old. What’s funny about Clyde is that he’s so bad that it’s almost good. If you do one things today, watch the unveiling of Clyde on YouTube.